Datation : 10th century B.C., 8th century B.C. 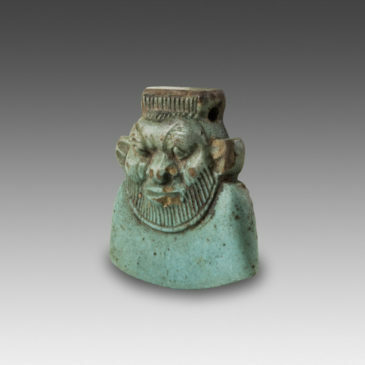 The pendant/amulet is in the shape of a small flat bust, with a slightly rounded bottom. 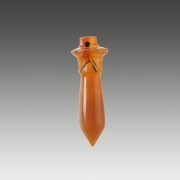 At the level of the crown, it is pierced horizontally for a suspension string, which would have allowed the amulet to be worn as a necklace, for example. The head, worked in low relief, shows the mask of Bes, which as a pars pro toto (part for the whole) represents the whole figure of the deity. 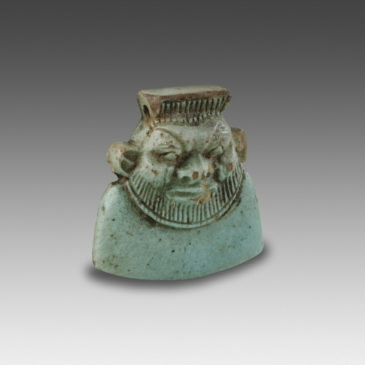 Despite the stylization, the mask of the god appears here with his usual grotesque features: a flattened face seen frontally, a deeply wrinkled forehead, eyes wide open, pug nose, leonine ears, wide crushed cheeks, a long beard with incised locks. On his head, Bes wears his traditional headdress made of feathers, rendered by simple vertical lines. This genie, known as early as the Old Kingdom but whose popularity significantly rose from the New Kingdom on, became one of the most famous figures of the Egyptian pantheon from the Third Intermediate Period onward and then throughout the 1st millennium B.C. Primarily a protector of women and children, Bes aided women in labor and watched after newborns. His terrifying ugliness warded off evil spirits and diseases. Bes was also the patron of musicians and dancers. 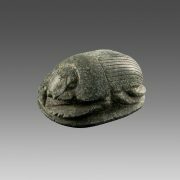 Privileged witness of popular piety, figurines and images of this god were very widespread in the Egyptian world. Used as talismans, they could, for instance, be worn as a jewel pendant, suspended from a door or in a room, threaded on a stick or on a pole, or placed at the corners of a bed. Some pieces might have served as rattles for children. 10th century B.C., 8th century B.C. 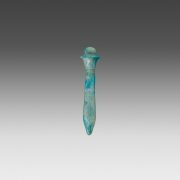 This amulet, pointed at its end, was modeled in the shape of a stylized papyrus stem. The suspension hole is located in the small semicircular tenon that surmounts the object.